Last week, we had the absolute privilege of hosting our friend Scotlund Haisley, president & founder of Animal Rescue Corps, in our home. 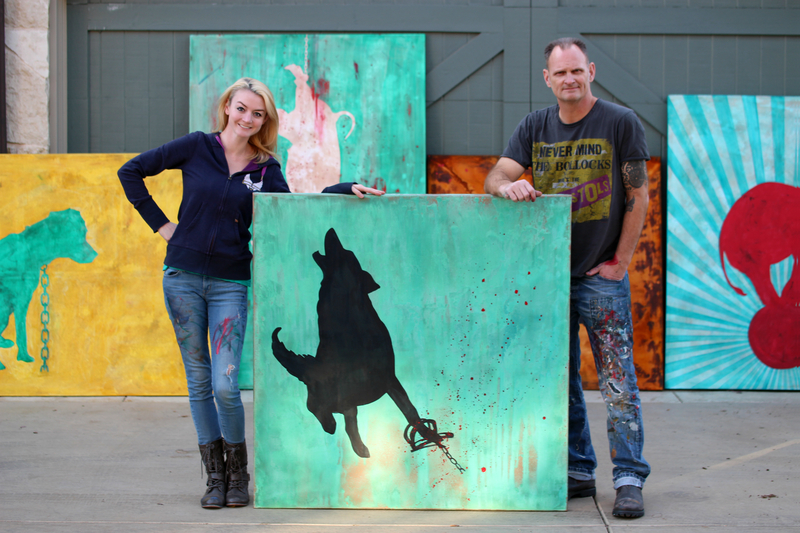 In addition to rescuing animals (ARC specializes in busting puppy mills, dog fighting rings, and hoarding situations), Scotlund is also an incredibly talented artist. 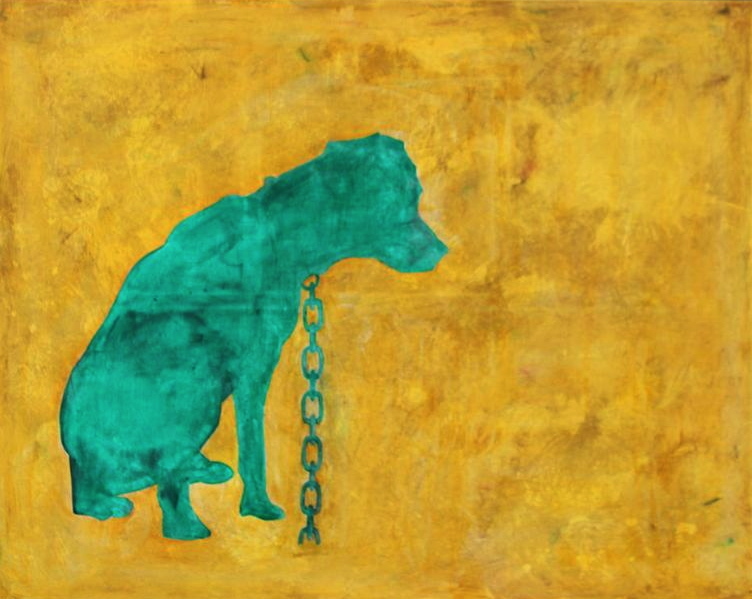 The subjects of his paintings are primarily animals he has personally been present for the rescue of (see his full body of work here), but this week he ventured into a new style. What started as a potential solution to our problem of having too much empty wall space in our home turned into a real artistic adventure. I was so thrilled to take part in the creation and conceptualization of some of these pieces, as well as to learn some tricks of the painting trade. The images depicted aren’t pleasant. They aren’t fun to think about, but they need to be seen. They need to be understood and they need to be remembered. By displaying them in our home, we hope to educate and inspire our guests that are still contributing to some or all of these forms of exploitation. As Scotlund explains (I’m paraphrasing), he intentionally used aesthetically appealing colors and textures to make the viewing experience more palatable for the average person, thus allowing them to consider the core issues without feeling the need to turn away. Each canvas was painted in multiple layers with different colors, resulting in backdrops of rich, multi-dimensional tones that in and of themselves are technically and artistically masterful. I’m starting with this piece, because I put the most of my time, energy, and passion into it. For reasons I haven’t yet been able to identify, fur cruelty is one of the issues that emotionally affects me most deeply. 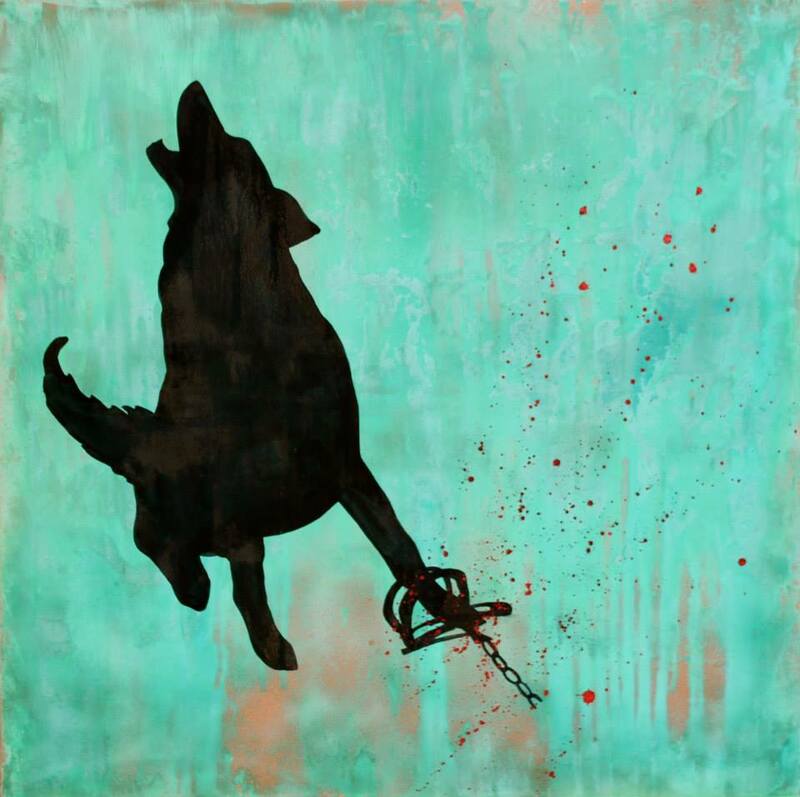 For years, I’ve been haunted by the photograph this painting was inspired by; in it, a coyote stuck in a trap howls in pain. It is absolutely deplorable that leg hold traps are legal in this country. Trappers are required to check their traps every 24 hours (can you imagine spending 24 hours trapped and bleeding alone in fear and agony? ), but there is little reinforcement of this already offensively liberal rule. My contribution to this piece was the creation of the silhouette, which required me learning way more about Adobe Illustrator than I ever thought I’d have to. I couldn’t be more impressed by Scotlund’s final result. 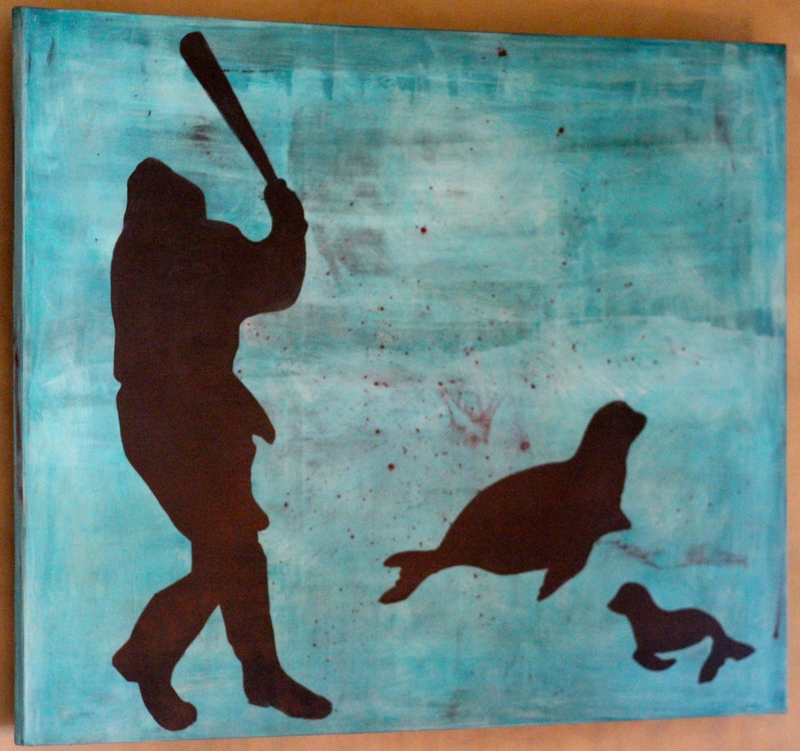 This piece is now hanging in our bedroom, which to many people might (justifiably) seem odd; to me, however, it’s daily motivation to hop out of bed and get back to combatting animal cruelty. I am always surprised when people use culture or tradition as justification for acts of animal abuse, cruelty, or torture. Am I to understand that because we’ve been habitually torturing a specific animal in the same way for hundreds or thousands of years that we aren’t allowed to question the practice’s morality? We certainly don’t accept that excuse when applied to atrocities against humans. Watching the evolution of this piece was fascinating. 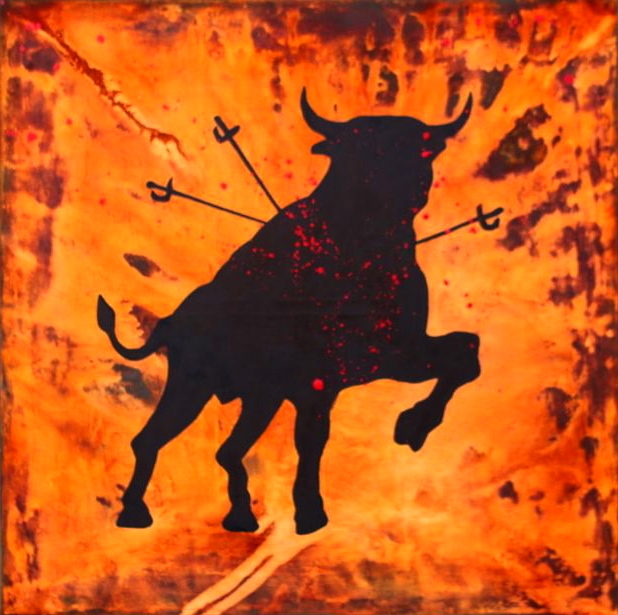 Scotlund began by painting the canvas in black liquid iron. After that layer dried, he used a spray bottle to apply a clear liquid acid. A few hours later, the canvas had completely rusted over, providing this complex, beautifully textured backdrop for this haunting silhouette. I love this piece. Not only for its aesthetic beauty, but also for its title. As part of the collaborative process, we all spent time brainstorming about the title and message of this piece. Without text, Scotlund pointed out, it could just look like a promotional poster for the circus- obviously not the message we want to send. After much back and forth, Scotlund’s final decision was “1805-201?”. 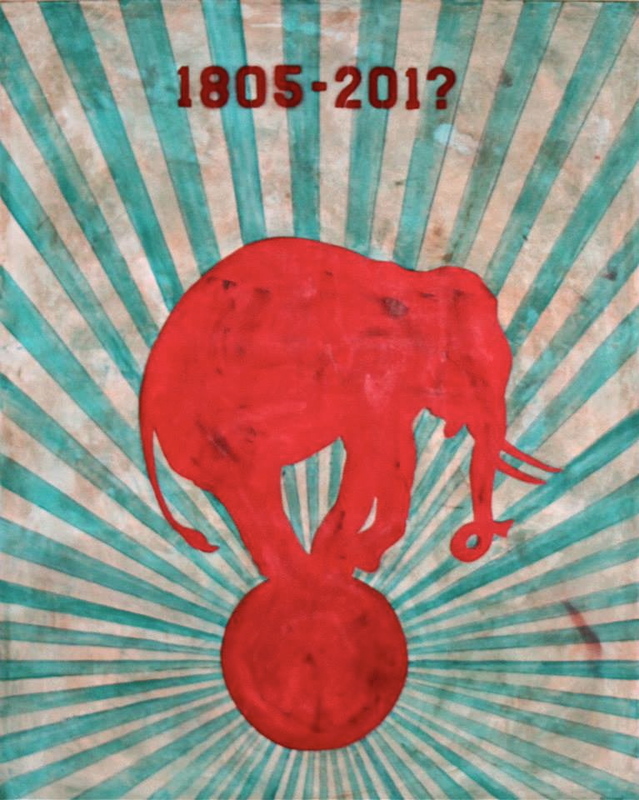 1805 representing the era in which performing elephants were first introduced to America, and 201? representing the inevitable end of humanity’s enslavement of these majestic, intelligent, curious beings for the purposes of profit and entertainment. While he could have easily used “20? ?”, I love the confidence put forth by the assumption that this ridiculousness will end in this decade. Dozens of countries have already enacted bans of either all animals or wild animals in circuses; it’s humiliating that we haven’t yet caught up. 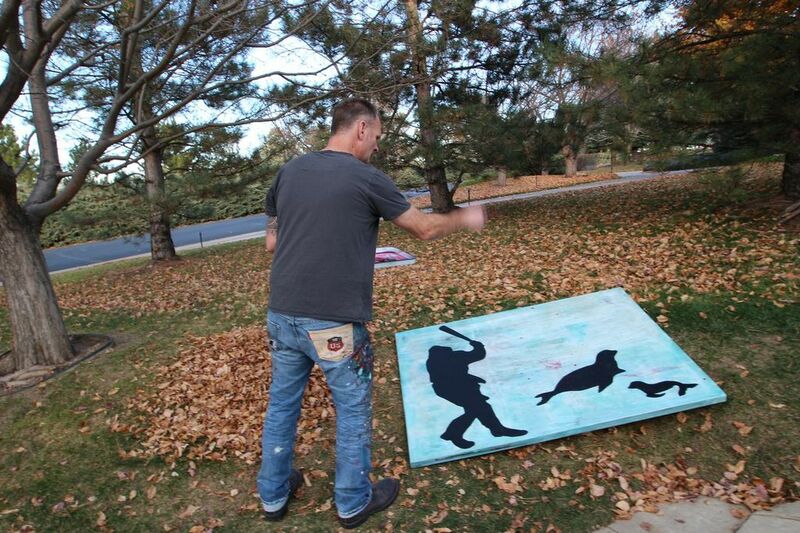 This painting depicts a scenario Scotlund has unfortunately seen countless times. Through his work as a humane officer, as director of an animal shelter, as a rescuer with HSUS, and now with Animal Rescue Corps, Scotlund has cut the chains off tens of thousands of abused or neglected animals, all of whom were considered by their owners to be nothing more than “property”. Life on a chain is not a life. It strips an animal of his or her freedom, comfort, and dignity. It transforms them from individuals into tools, into weapons, into decorations, into property. Though Scotlund has had the privilege of liberating countless animals from these chains, there are far too many more out there still awaiting rescue. We struggled for a while in naming this piece. 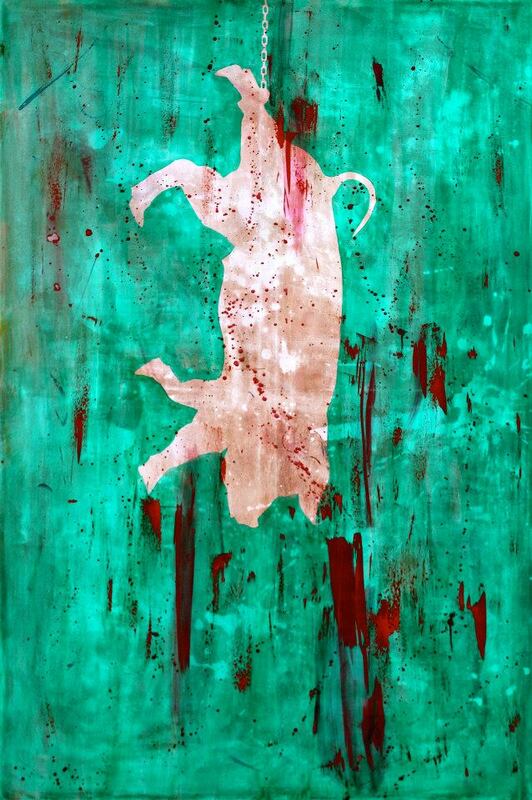 If you haven’t yet caught on, the titles of most paintings from this series (the exception being “1805-201?”) are meant to identify the excuses used to defend these barbaric practices. The (too) obvious first choice for this piece was “food,” but none of us felt that was very strong, nor was it specific enough. On the last day of painting, Scotlund came up with “Protein”, which immediately stuck. It never ceases to amaze me in this day and age that so many supposedly educated human beings still believe that animal protein is vital for our survival and that without killing others, we would all suffer from malnourishment. This, of course, is touching on an issue deserving of its own entire post, so I’ll leave it at this: most humans, especially those living in the first world countries responsible for the vast majority of industrialized animal slaughter, have access to more than enough sources of protein without resorting to eating the body parts of formerly sentient beings. This excuse has been played out. This piece (which is not misshapen; it was photographed on a curved wall) is truly gorgeous in person. The colors are serene and captivating enough to make staring at this archaic form of cruelty somewhat palatable. What I really appreciate about this imagery is the sense of urgency I feel every time I look at it. For a brief moment, I believe that if I could just get there in time, maybe I could intervene and save the lives of these innocent victims. I hope other viewers will sense the same impending tragedy- especially those whose apparel choices are still paying the salaries of these club-weilding hunters. Scotlund applying the final touch: splattered blood. If you ever have the opportunity to view Scotlund’s work in person, please don’t miss your chance! Photos can never do justice to the levels of technical complexity or emotional depth displayed in all of his artwork. Additionally, if you aren’t familiar with the work of Scotlund’s organization, Animal Rescue Corps, make sure to follow them on Facebook and watch their inspirational (and beautifully shot and edited) rescue videos. Next Krže Studio Crowd Fund SALE! Wow! These pieces are amazing! They send an important message. I do like the “happy” background colors and ominous silhouettes. Quite a contrast! I get that some people might not be comfortable with them in their homes. I would hang them in mine. Good art invokes strong feelings and starts a dialog, right? 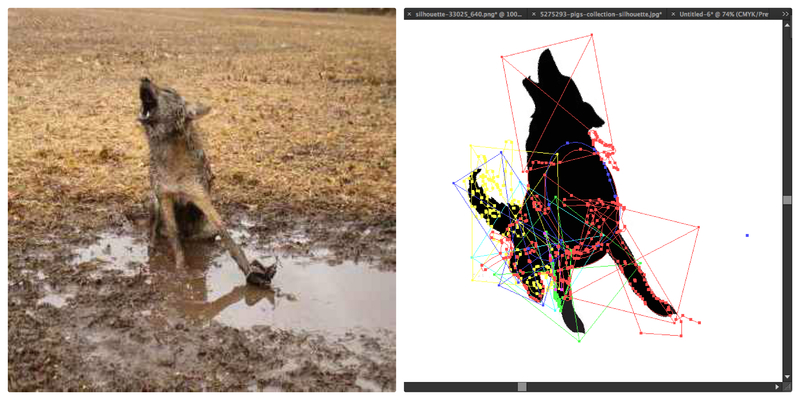 And, like you, I’d find the images motivating. Must do more! You’re so lucky to have these pieces and to have been able to collaborate with the artist. Thank you so much for sharing this – it is truly amazing work. So many emotions going through my mind right now!